Born in: Hyattsville, Md. & Jamaica, N.Y. I met Iris in Boston over 40 years ago, not long after in 1976 we both moved to San Francisco in a beat up old station wagon with all our stuff and not much money. We came out here because we heard that the City was racially and ethnically diverse, there were great political groups, and it provided a refuge for LGBTQ people like us. What do you love about the Mission District? 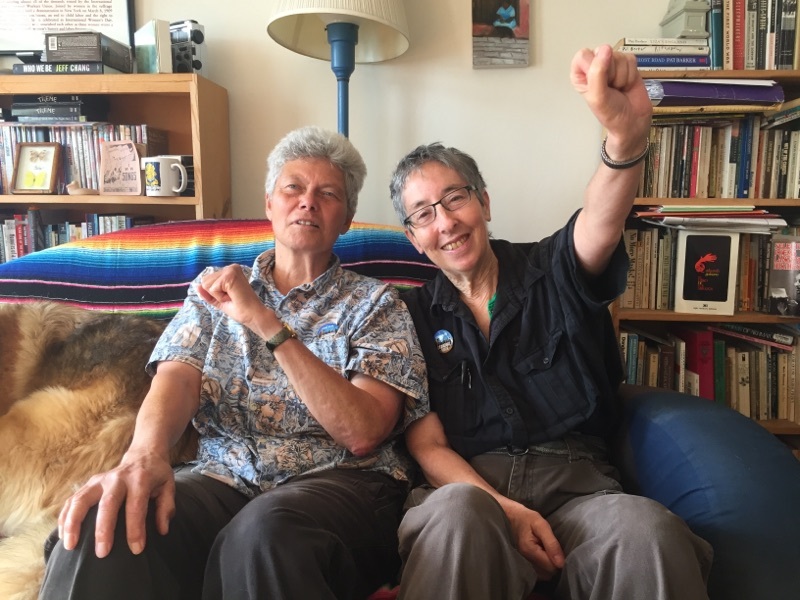 Fran and I have lived in the Mission for 40 years in mostly rent-controlled apartments. We stayed here because the rents were cheap, we are walking distance to public transportation, and real close to our work and the shops we like. We know our neighbors; we talk to them at the laundromats, bus stops, and on the streets. We’ve gotten to know our community and our neighbors over many many years. Seniors like us are important in a community. We have been here for the longest time, we have historic memory. We can tell you where the old appliance store used to be, or which family lived at that home on the corner before they got kicked out, before the high rents and gentrification. We have been part of creating a supportive community over the years. We see familiar faces at protests, we see the grandmas at community activities, and we are there for each when we are sick. As a nurse I have taken care of my neighbors, I have taken their blood pressure and provided advice. Do you feel that you are you at risk of displacement? There are still many of our old neighbors around us, but we all feel vulnerable that we can be evicted. Landlords can decide to sell at anytime and cash in on all new tech money and luxury condos. I spent years taking care of people at the local shelters and churches, like Santa Maria. Two-thirds of the people that go to shelters are seniors or people with disabilities. You start to think about what is going to happen to people like Iris or me, as we get older, and things get harder for us. I ask myself, where will I go? I don’t have the energy to start over. The Mission is what I know, it’s my neighborhood… this isn’t the time in our lives to change everything and leave our community. The Mission needs its elders and children to remain and thrive. The City is not just a place to make your money. We have worked and contributed to this City, we have earned our rest and care. We contributed to society all these years, now it’s time for society to give back. Now is the time because we are in a desperate situation, people in tents, on the streets, Latinos and African American families being forced out to Vallejo. We are losing the soul of our City. Do you support affordable housing for seniors in the Mission? Please sign our petition in support of 1296 Shotwell 100 percent affordable-housing rentals for seniors.